What are the Different Types of Private Sector Industries? Grocery stores are a commercial private sector industry. 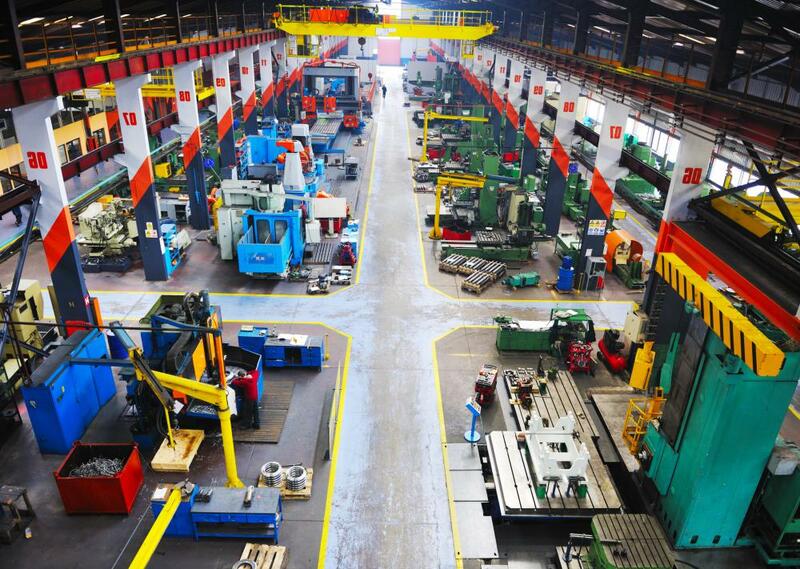 Industrial industries are those that manufacture goods. The term "private sector industries" refers to companies and corporations that are not controlled by the government. Such companies are generally broken down into three categories: industrial, commercial and agricultural. Industrial industries are those that manufacture goods, while commercial industries are those that sell goods and services. Agricultural companies produce and distribute foodstuffs and other items that are grown or raised. In developed countries, industrial corporations traditionally account for a significant percentage of private sector industries. These include companies that manufacture parts as well as those that assemble them into finished products. A number of specific industries fall under the industrial umbrella, including automotive, aeronautics, textiles, pharmaceutics, bioengineering and metal casting. Food refineries and packagers generally fall under the industrial category because of the types of facilities necessary for production. Commercial private sector industries are additionally subdivided in two ways. The first is how they sell their product. Commercial industries who sell goods to the general public are called retailers. This includes traditional outlets such as grocery stores, specialty shops, department stores and drug stores, but also includes online outlets such as online clothing stores or online book sellers. Some commercial private sector industries buy from manufacturers and sell to retailers. These corporations are called wholesalers. Not all commercial industries involve wholesalers. In some cases, the retailer can buy directly from the manufacturer. Industries that commonly use wholesalers include manufactured florals, office supplies and home goods. The second way to divide the commercial segment is by the type of product the business sells. Companies that sell tangible items sell goods. This can be anything from a computer program to a car to a pair of shoes. Other commercial companies sell services, such as house cleaning, accounting or automotive repair. In some cases, the business may sell both goods and services. Agricultural businesses are the subset of private sector industries that grow or raise product. This generally refers to all farms, be it a small family farm or a multi-national growing conglomerate. Products include meats, grains and vegetables. The three main types of private sector industries often work together to provide consumers with a product. For example, a farmer, whose farm is an agricultural business, might grow green beans. He then sells those to a food packaging company, who is part of the industrial segment. That company processes and packages the beans. The packager then sells the resulting can of green beans to a grocery store which, as a commercial retailer, sells the can to a consumer. What is a Private Sector Business? What is a Private Sector Investment? What is Private Sector Banking? What are the Differences Between the Public Sector and Private Sector? @everetra - Personally, I think that retail faces a challenge on all fronts. I just heard that one major retailer is changing its sales strategy. From now on, they are no longer having sales; they are permanently slashing prices forever. Will it work? I don’t know. But no doubt they feel pressure from other outlets, most notably online stores, which can sell stuff at a fraction of what a retailer would charge. I think service is the best place to be in the private sector; although if you are doing well in manufacturing then more power to you. @nony - I currently work for a wholesale distributor. We sell thousands of industrial products to other distributors across the country. Basically we buy stuff from manufacturers and house them in distribution centers and then ship to our customers. We operate a business model that doesn’t seek to undercut our distributors. In other words, we don’t sell to their customers directly – we only ship to distributors, not end users. That has helped us to succeed in building value and trust with our distributors. Some wholesalers will sell to anybody. Take a specialty merchandising company which imports stuff at rock bottom prices. You sign up to be a distributor and so they sell you some of their stuff. However, they could also sell directly to the retail establishments too. What’s the point of that? They’ve just undercut your business. We don’t do that, and it’s helped our success I think. @hamje32 - Yeah, the free market operates well with the invisible hand. Honestly there are few cases where government intervention enables a private sector business to operate more effectively or profitably. Take ethanol, solar power, wind power and agricultural subsidies. All of these industries have received substantial government subsidies and yet that has not helped them to be profitable; if there isn’t enough demand then nothing will happen. The biggest fiasco in that regard is the Chevy Volt electric car, which has been offered up with all sorts of tax credit incentives for the consumer to buy; yet it has failed miserably in the marketplace. Private sector companies operate best when they operate out self interest. Build things that people want and then the companies will succeed. I am a follower of the late, great Milton Friedman, a Chicago Nobel prize winning economist and an advocate of free market capitalism. The book which changed my thinking on understanding what is private sector industry and how it operates is Free to Choose. In that book, Friedman takes the reader on a journey through the making of a simple pencil, from the first materials to the finished product. Friedman argues that many players are involved in the making of the pencil, and that they all operate out of self interest, without any need for government intervention. Through their own self interest, and the forces of supply and demand, pencils are created which meet the needs of people. The free market, Milton argues, is far more efficient at determining the appropriate price points for the materials than is the government. It's seems like the private sector industries (at least in the United States) are among the most important. Agriculture and food sales are private sector businesses, and I'm pretty sure this country would grind to a halt if we weren't able to purchase food at our local grocery stores. Also, pharmaceutical companies are private sector, and they're very important as well. If it weren't for them, we wouldn't have important medications or even vaccines! @starrynight - Well, we could sit here all day arguing over what is the private sector and what is the public sector. However, I think we do have a private sector in this country. The government doesn't exert total control on private sector companies the way it does on the public sector. Yes, businesses are regulated, but it would be anarchy if they weren't. It's still not like the government tells businesses how to carry out every little detail of their business. Businesses get to make most operating decisions on their own, which wouldn't be the case if they were public sector companies. I would argue that here in the US, we don't truly have private sector business. As one of the other posters pointed out below, our government regulates and subsidizes business a lot. I think this kind of thing definitely counts as government control. The government decides what safety regulations businesses have to follow, what benefits they must offer their employees, and how they can sell their good and services. This definitely doesn't sound very "private" to me. @whiteplane - Great point. It always really annoys me when you hear these free market advocates suggest that in the absence of government, capitalism would run smoothly, equitably and efficiently. I think that capitalism tends naturally towards self destruction and without laws that take into account the long view a number of industries would have shot themselves in the foot decades or even centuries ago. I always think about clean water regulation. In spite of the importance of water, industries would pollute water sources if there were not explicit laws against it. And then where would they be? Every industry depends on water for something. If you ruin the water then all industries suffer. And yet this does not stop businesses across the board from polluting mindlessly. We can see then how well the private sector does when left to its own devices. There are literally thousands of different private sector industries but one important thing to consider is that few private industries could exist without some kind of public sector component. This might come in the form of subsidies, regulations, research agreements, government contracts or congressional legislation. The government has an important function to play in the smooth continuation of global commerce. Without an entity that can remain both objective and authoritative business would go haywire.